You know that you'd be hard pressed to find a more worthy organization to support than the Boys & Girls Club of Santa Clarita Valley. What you may not know is that the organization just announced one heck of a fun way to do it. 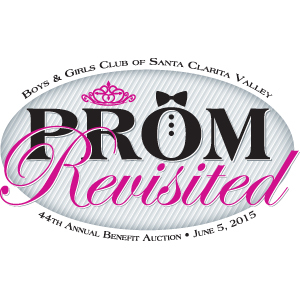 On Friday, June 5, the org's 44th-annual benefit auction will have SCV supporters dusting off their fanciest dated duds for "Prom Revisited." The evening will feature hundreds of exciting live and silent auction items, gourmet food, raffles, entertainment and dancing. Doors open at 5:30pm; dinner seating begins at 7:30pm with the live auction to follow. Tickets start at $150; donations are tax deductible; sponsorships are available. Since 1968, the vision of The Club has been to provide every child with the essential tools needed for a successful, bright future. Every day, The Club strives to improve each child's life by instilling self-esteem, courage and positive values through all of their educational programs. Nearly 2,100 young people between the ages of 7 and 17 are engaged in proven programs that reinforce positive values and provide avenues for personal growth and development. Youth go to The Club to receive tutoring, homework assistance, computer training, sports, social recreation, education, mentoring, arts and crafts and so much more. Members gain confidence by developing a sense of usefulness, competence and belonging. Samuel Dixon Family Health Centers provides affordable quality outpatient healthcare services and programs, health education, community resources and referrals to residents of Santa Clarita Valley, making a special effort to serve the uninsured and under-insured. It is the mission of Samuel Dixon Family Health Centers to never refuse healthcare services to anyone, regardless of their ability to pay. With three primary health centers - Val Verde Health Center, Canyon Country Health Center and Newhall Health Center - they provide immunizations and vaccines, physicals, screening and diagnostic tests, well-baby care, preventative programs, family planning, women's health services, treatment of illness and injury and more. This past year, Samuel Dixon Family Health Centers provided healthcare to over 4,400 individuals accounting for over 11,000 patient appointments. Find out more by visiting www.sdfhc.org. Mission Valley Bank's local roots run deep, motivated by the desire to be an integral part of the area they serve. A strong community thrives on personal relationships and Mission Valley Bank supports - and is honored to be supported by - the Santa Clarita Valley. Mission Valley Bank is more than just another local bank. They are a full-service, independent, commercial bank that is locally-owned, community minded and relationship driven. They're proud to have earned their reputation as trusted advisors. Mission Valley Bank is as dedicated to their customers' success as they are. They appreciate their business and welcome the opportunity to earn yours.